Bill Hader and Kristen Wiig, two very funny comedians, come together to star as estranged twins in this dark comedy drama. Although the emphasis is on drama, it’s really not their usual fare and I welcome it. 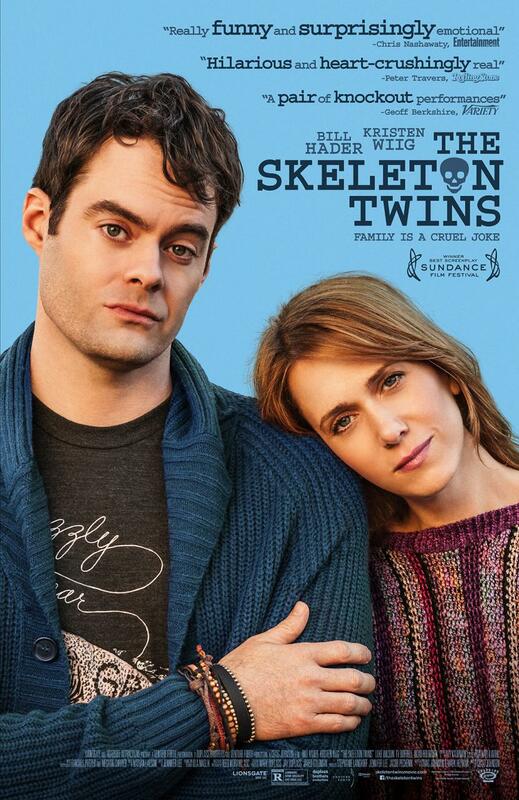 Having not spoken for 10 years, Milo and Maggie Dean (Hader and Wiig) are reunited when a failed suicide brings them back together. They get reacquainted and realise, even with the difficulties between them, that they are stronger and better together. Suicide, infidelity, a desperate longing for an old love, plain old unhappiness and dissatisfaction with the lot life has given them is rife in the twins’ world and their relationships with their parents plays a big role. This film does not break the bank of innovation but remains a charming, heartfelt indie film. Craig Johnson direct his second feature and wrote it with Mark Heyman who also wrote the screenplay for Black Swan. The brothers Duplass, Mark and Jay, were on board as executive producers. It must be said that Hader and Wiig show great dramatic chops and I’m sure we’ll see more of them given a chance to do more. Support comes in the form of Luke Wilson and Ty Burrell, both creating interesting roles. Joanna Gleason is suitably spiky and passive aggressive as the mother of the twins. This gentle, intimate film is worth a look, not too long and great if you like the actors, who both do a great job. Firstly, biopics never fully satisfy, they are overly dramatized, obviously, and then comes the artistic license; this is not what turns me off. There will ALWAYS be someone who takes umbrage because “‘insert name here’ “didn’t wear that tie, etc, etc.” I am being flippant but you get the drift. For me, I find that they rarely leave a lasting impression. Malcolm X was an exception. For me. I went into this with many reservations. Will it be an emotional blackmailing piece because of the subject matter? Will David Oyelowo be any good? I am happy to say that I was wrong, on all counts. Oyelowo is brilliant and deserved a nomination, as should director Ava DuVernay. The snub seems to be a political one. 12 Years a Slave was lauded last year and the voters either didn’t see Selma or decided to go the Cooper route. I have yet to see The Imitation Game or The Theory of Everything but my instinct tells me that although the performances will be special, the films will be average. My money is on Birdman for Best Film. It’s great that we are getting more female directors gaining more commercial and critical success and I welcome it. DuVernay treats the subject matter with depth, sensitivity and respect and it comes through. This is an important film; it is the first feature film to focus on Martin Luther King Jr, which is crazy that it took so long to do so. 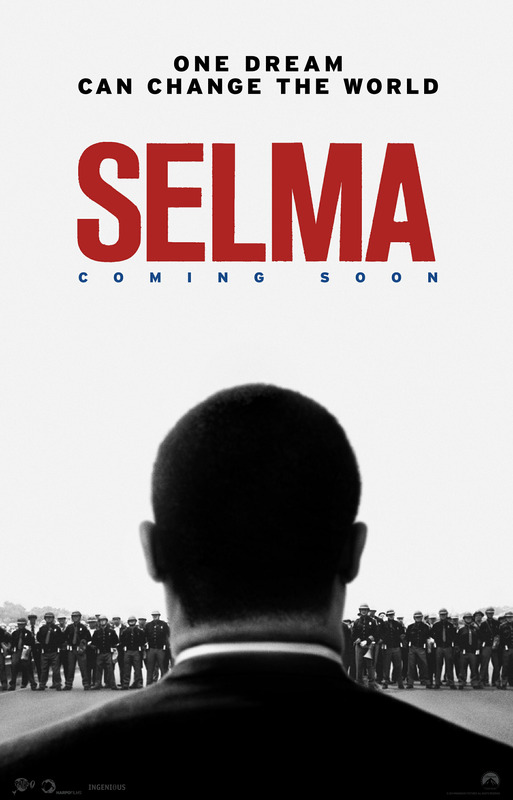 Set in 1965 and centring around the Selma to Montgomery civil rights voting march and written by Ava DuVernay and Paul Webb, this film succeeds on many levels. The cast are all brilliant, bringing their ‘A’ games to the table for such a prescient piece of American history. British actress, Carmen Ejogo (The Purge: Anarchy) plays Coretta King (she previously played her in Boycott in 2001) and delivers a performance of subtlety and skill. Tim Roth is Governor George Wallace, steeped in the racist ways of Alabama of the time and manages to make him three dimensional, veering away from pantomimicry. Wendell Pearce (The Wire, Treme) is Rev. Hosea Williams and, as usual is a joy to watch. Stephen James plays John Lewis, the chairman of the Student Nonviolent Coordinating Committee (SNCC), who was a key member in the endeavour to end racial discrimination and segregation. Common plays James Bevel. Tom Wilkinson is brilliant as Lyndon B Johnson, eschewing caricature for a performance with layers. Nigel Thatch plays Malcom X in a fantastic scene with Coretta King. Oprah Winfrey imbues her Annie Lee Cooper with dignity and delivers a performance filled with respect and admiration for this incredible woman who not many people know about. That’s one of the joys of this film, the fact that a lot of the key members are featured and it shines a light on these brave, heroes of recent American history. Special mention goes to Dylan Baker who portrays J Edgar Hoover with a coldness and menace in the one scene he appears in. The cinematography is inspired by Bradford Young who did a wonderful job on the low budget, Pariah. Jason Moran is on soundtrack duties and creates a perfect accompaniment to the visuals. For a film that I had expected to disappoint, I was wonderfully surprised.